Om'echaye, located on Hallandale Blvd, close to US1. We are grateful for their commitment to helping us make Vibration of Life happen. Check their website for a schedule of classes, including frequent offerings by Alex & Javier. Alexander Cohen, Co-founder and one of the Executive Directors of Omechaye, a holistic wellness center in Hallandale Florida. He is a recognized teacher, inspirational coach and presenter who has a unique ability to integrate mind, body and spirit in his work. He is a certified Yoga instructor, a postural alignment specialist, a healer, meditation teacher, a Pilates and fitness instructor, a massage therapist and a certified personal trainer from the National Strength and Condition Association (NSCA). He graduated from the Institute of Integrative Nutrition (IIN) becoming a Holistic Health Coach. He is also an alumni from Nine Gates of Mystery School and he hold a certification from the transformational energy institute.Through his versatility and creativity Alex has developed different fitness programs and his presentations and workshop had being presented in Seminars in Europe and South America. Alex holds a Functional Trainer Specialist certification from the Institute of Human Performance and he is a Weight Management Control Specialist. His personal mission or Dharma is to be at service and positively influence people’s lives through a holistic approach to wellness. 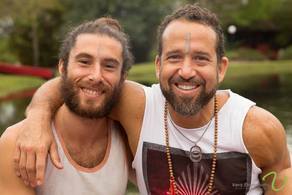 Javier Wilensky (Co-founder of Om’echaye) was born and raised in Buenos Aires, Argentina. After graduating from Universidad de Ciencias Economicas y Sociales (UCES) with a BA in Business Administration, Javier moved to Florida to found Om’echaye Wellness and Fitness center. In 2002 Javier discovered IYENGAR Yoga as a result of a constant quest to improve concentration and release stress; this discipline not only helped him overcome these challenges but also opened the doors to a new spiritual path. From the moment Javier became a certified Iyengar teacher, he has thrived to inspire individuals to be sensitive to the gift of life and be thankful for their body and their challenges. With his career as a Yoga Director/Owner at Om’echaye Javier has grown and gained the experience of a lifetime while continuing to learn something new every day. For the past four years, Javier has taught several workshops and more than ten classes a week.